When I was working as a corporate lawyer, I didn't always have to wear the black and white attire. We were free to wear colours, as long as it suited the corporate look. But what I really wanted and couldn't find was a white suit. That's why I came up with a white suit through aere. 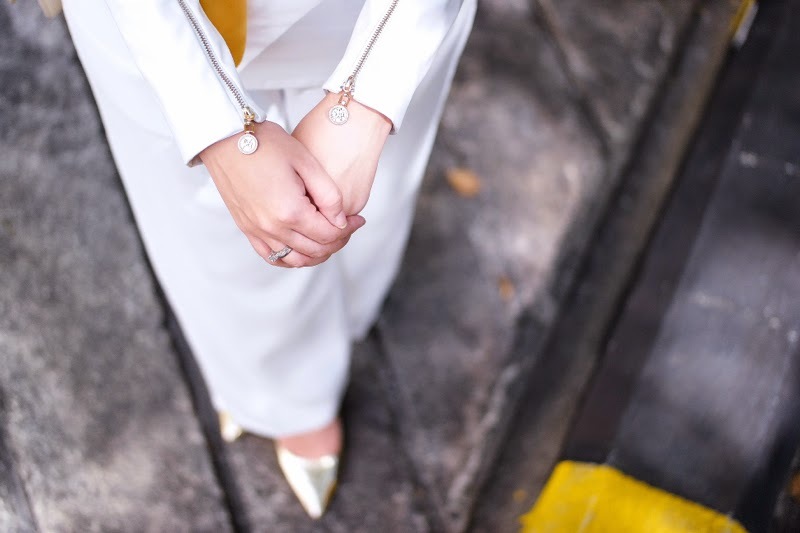 So in this post, I'd thought I would give some tips on how to wear aere's white ivory suit. First of all, a lot of people say that the white ivory suit is impractical at work. For men, yes, I think it's a no-no to wear a white suit for work. However, for women, it's different. Of course, it depends on what profession or field you are in, but if the workplace isn't too conservative and allows for a little sense of fashion, you should consider wearing a white suit. White is such a strong and pure colour, giving a bold statement just by itself. Everyone is drawn to the crisp and attractive white. It's a symbol of purity. It's also easy to match up with. Why is it easy? Because similarly to black, everything goes well with white. For this look, I paired up the SALVIA Blazer in Ivory together with the ASTER Pants in Ivory with the ROSEA Top in Ivory and a gold-coloured scarf from dUckscarves. 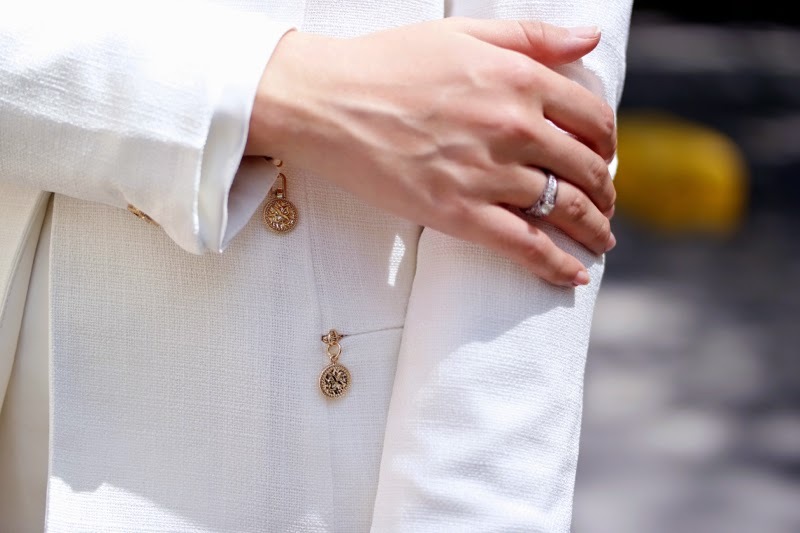 I think it gives a modern, formal yet fresh vibe and especially since women have more pieces and accessories to work with, the white ivory suit can be used in the office but for that it's recommended to use darker colours for your tops or scarf (brown, black, dark blue) to play down the white ivory suit. But, the white ivory suit can also be used for a more casual look. Go for bright and fresh coloured tops, especially pastel. Vibrant print tops can also be worn underneath it and it's just perfect and not too formal. You can also use the white ivory jacket and pants separately. You might be wondering, what can be paired with a white ivory jacket right? Try using it with your boyfriend denim jeans or either dark brown or blue skirt. Similarly, the pants can be used with a navy blue top. It's not too tricky. The trick is to know the look you're going for and to be confident of your own style. Keep experimenting and mix it up! 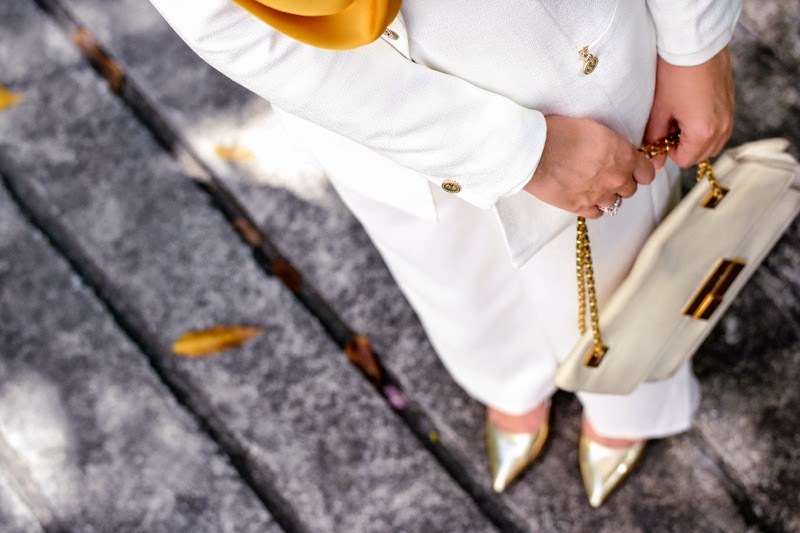 To know more about the details of the aere pieces I'm wearing in this post, just click SALVIA Blazer in Ivory, ASTER Pants in Ivory and ROSEA Top in Ivory. Have fun styling your looks!